Endorsement comes as progressives build power in similar races aimed at fixing a broken criminal justice system. 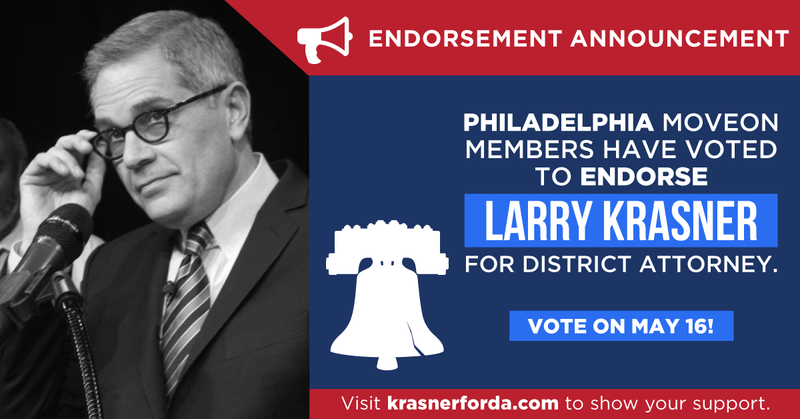 PHILADELPHIA — Philadelphia members of MoveOn.org Political Action have voted overwhelmingly to endorse Larry Krasner in the race for the city’s District Attorney, with 80% of votes cast in favor of backing Krasner. In the endorsement vote, members praised Krasner’s progressive record on criminal justice and racial justice. Krasner also has the support of numerous progressive organizations, including 215 People’s Alliance, AFSCME 1199C, The B.L.O.C. Party (Build, Lead, Organize, Campaign), Color of Change, Democracy for America, Food & Water Action Fund, Liberty City LGBT Democratic Club, Pennsylvania Federation Brotherhood of Maintenance of Way Employees (BMWED) – IBT, Pennsylvania Working Families Party, Philly for Change, and Reclaim Philadelphia. MoveOn’s endorsement of Krasner comes as progressives, led by Color of Change, are building power in similar races nationwide that are aimed at fixing a broken criminal justice system, including with the election of MoveOn-backed Kim Foxx as Cook County State’s Attorney in Illinois last year. MoveOn will mobilize its nearly 40,000 members in Philadelphia to volunteer and vote for Krasner, and will continue to mobilize around other progressive candidates tackling criminal justice nationwide. “Philly has twice as many inmates as the national average and our jail population has doubled in the past 30 years. Krasner is the only candidate committed to holding our justice system accountable and standing up for those impacted by the cash bail system, stop and frisk, and mass incarceration.” –Candice J. “Larry Krasner is the most progressive of the candidates. His whole reason for running was to upend the current pattern and practice of upping charges as much as possible. He opposes civil forfeiture, supports diversion of drug addicts and others who can be better helped outside the court system. His opponents have begun to shift their proposed policies to echo his, but he is the REAL DEAL—someone who understands that our current justice system is broken and that we can’t just continue to follow the direction we have been taking for many years.” –Laura S.
“He has struggled against unjust criminal prosecution and prison system for decades. He is backed by all serious reformers on the ground. Other candidates have adopted progressive messaging because it is popular, but those who do real work (small civil rights lawyers, people who work with prison population, public defenders, local grassroots groups) are all supporting Larry because they know from his record that he will actually work to change the system, not just the rhetoric.” –Adams R.